K2 is available as a Console (with a PC built in) as well as a standalone piece of software. 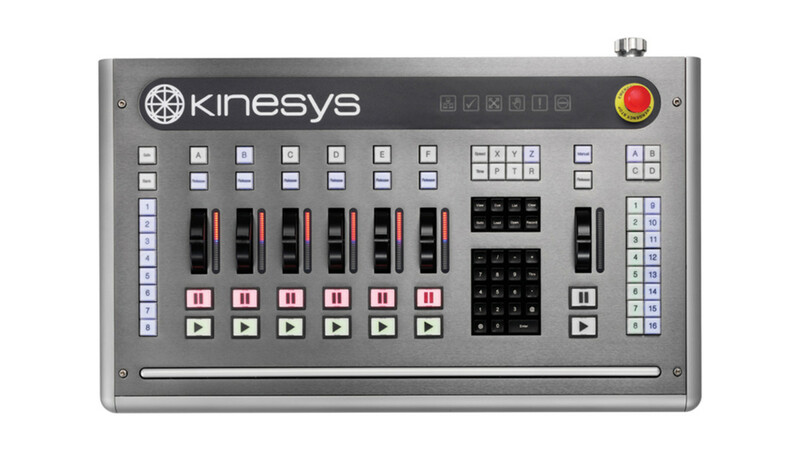 The Console provides a self-contained hardware solution (custom built by Kinesys) which includes a PC optimised to run K2, delivering the best possible user experience. 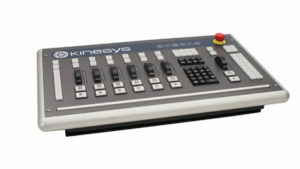 The Console allows for faster programming and easier operation with dedicated buttons and playbacks for controlling K2. An Emergency Stop button and Dead Man’s Handle are also built into the Console for connection into an emergency stop system, including the Array PD-ES. The programming and playback environments display real moving objects as realistic graphical representations. These are positioned in a 3D space in the correct proportions and relation to the stage, set and other items as well as other moving objects. All these graphical items can be created in industry standard CAD packages and imported directly into K2. Programming then becomes very simple, with manipulation of the moving objects as straightforward as click-and-drag. The ability to move objects in real world axes, X, Y, Z, pitch, tilt and rotate makes programming very intuitive with K2 shielding the user from the complex multi-dimensional calculations required and instead presenting them with easy to use programming parameters. User programmable limits and clamps allow envelopes of motion to be easily constructed around objects. When combined with numerous other safety features and extensive feedback to the user, the programmer is in complete control of the devices being used. K2 is not just limited to winches and chain hoists – any number of devices can be connected to this powerful and flexible system. Personality files make integrating new mechanical devices into the system very straightforward. K2 includes the ability to output positional information to media servers, allowing for a great deal of creative freedom and flexibility when using motion and video together. A free demo version of K2 is available for download. This version of the software is fully featured, but will not output any commands to carry out movement. A full K2 license can be purchased by contacting us at info@kinesys.co.uk. This ground breaking product combines the best aspects of existing programming methodologies with some stunning new concepts. 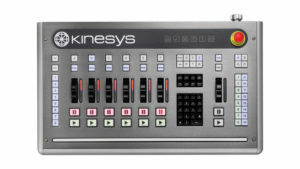 K2 is Kinesys’ motion control console and employs a intuitive approach to automation programming. The operator uses ‘click and drag’ to move objects on the screen within a 3D world rather than typing positions into a table. This gives instant feedback as to the object’s position in relation to other moving items. Coolux have included K2 integration in their Pandoras Box media server via their Widget Designer software. You must use Coolux Widget designer V4.0 Rev 382 or later, and K2 V1.2.219 or later. You must also select Mode 2 as shown in the screen shot below. 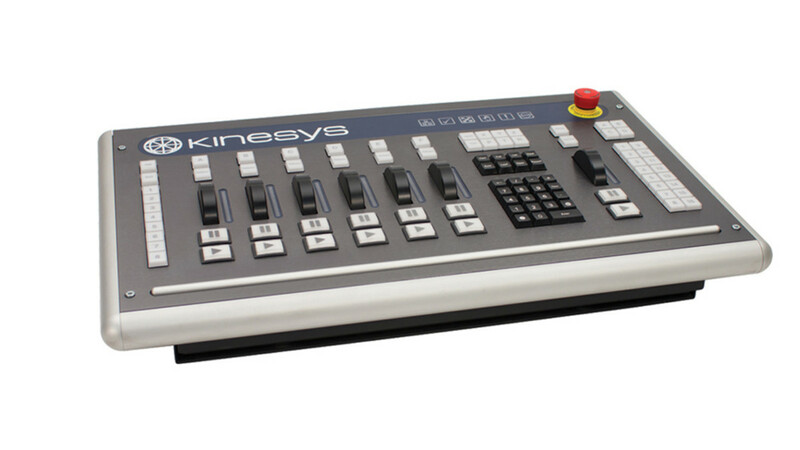 You can now select Kinesys as an input node which allows K2 construct position and speed data to be used for logic programming. For more information on Pandoras Box or to for technical information relating to using the Kinesys input node please contact Coolux. 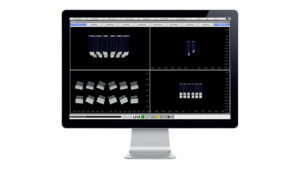 Capture are the latest company to integrate K2 with their software. This integration requires version 1.2.219 of K2 and Capture Polar 2.8. Capture have produced a video which explains how to configure K2 and Capture Polar to communicate via the multicast positional information sent out via K2. For more information and any technical support on Capture please go here. Our K2 software can now integrate with the Martin P3 video processor via the multicast positional information sent out via K2. In order for this integration to work you will need version 1.2.219 or above of K2 and version 2.1.0 of the P3 System Controller. 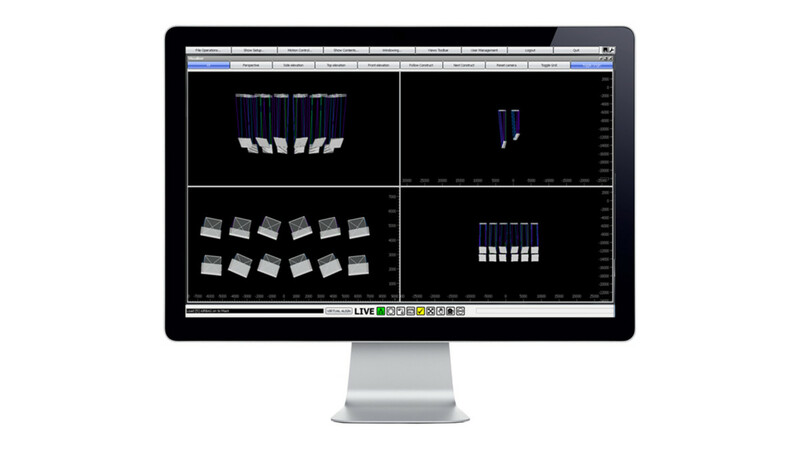 Using these two systems together enables mapping (position and rotation) of video onto panels that can be tracked in real-time, without user-intervention or programming. Martin have written up a very comprehensive guide on their web site covering setting up the P3 and K2 which can be viewed here. Any questions relating to the setup or operation of Martin software or equipment should be directed to Martin support. When installing K2, it is important that this is done when logged in as the administrator of the computer. If you do not have full administrator privileges then this can cause problems with certain aspects of K2, including logging and running a tracking backup. Encoder scaling is the number that is used to ensure that the distance an object (with an encoder attached) physically travels matches the distance that our software thinks that it has travelled. For example if an encoder scaling is incorrect moving an object in our K2 software 1m could result in the object only physically travelling 75cm. Each different type of encoder will have a different encoder scaling, this can also vary by manufacturer and model. How do I work it out? This will typically give you a four digit number. When working out encoder scaling, first mark or note the physical starting position of the object you are moving. Then move the object 1m in K2 or Vector and measure how far the object as actually travelled. These measurements combined with the encoder scaling you were using to carry out the test provide you with all of the information that you need to work out the new encoder scaling. The Excel spreadsheet has predefined fields that will work out the above calculation for you. The Mac Dashboard widget is compatible with OS X 10.4 and above. To get DMX into K2 you need to use a K2 DMX dongle, which can be purchased through one of our distributors. DMX can only be used for controlling the position and speed of an individual axis on a construct, you can assign each axis a unique address if you wish. There is no way to trigger a cue using DMX. Each axis of movement requires 3 DMX channels, the first two channels are a 16 bit position value and the third channel is 8 bit speed. To control an axis via DMX you first need to assign it a universe and a base address, the universe is always 1. In the Programer select the Preset field and select either DMX True Position or DMX Scaled Position. True Position takes the 16 bit value (0 – 65535) and runs the axis to whatever value in mm is sent via the DMX. Scaled Position treats the 16 bit values as 0 – 100%, with 0% being the lower construct limit and 100% being the upper construct limit. K2 ‘locks’ itself to the machine using the unique MAC address of a network card. If the machine K2 is installed on has multiple network cards it will lock itself to the one with an active network connection. If no active network connection is present then it will pick the first one assigned by Windows. A problem can arise if the network adapter K2 has been licensed to is disabled when launching or running K2. An example of this would be a machine with a wireless and wired network connectivity, where K2 was licensed using the wireless internet connection, which is then disabled when using K2. If this happens K2 will start up in Demo mode. In versions of K2 above 2XX it is possible to change the license details and network adapter using the About window in K2. In versions of K2 below 2XX it is not possible to change the network adapter once licensed. There are two options to remedy this situation. Uninstall, unlicense, reinstall and relicense the existing version of K2. To do this follow the instructions below. Start K2 (ensuring you are using have the appropriate network connection enabled), you will be presented with a license screen asking for K2 to be licensed, follow the instructions to relicense K2. K2 has the ability to broadcast positional information via a multicast network transmission to a number of different video and show control systems. These systems can then use that data to track movement and program their systems to respond accordingly. One example of this are Green Hippo media servers, they can take the positional information broadcast by K2 and manipulate their video output to match the movements of the automation system. For instance to move an image projected on a screen, as the screen is moved via K2 to ensure the image and screen are locked together. Data is sent in UDP format to a multicast address that can be changed as required in the K2 software. The data will be coming from a dedicated network card that can be set to any appropriate IP address and subnet mask. K2 uses the notion of Constructs when dealing with moving and controlling objects. In Vector and other similar motion control applications, you are always working with the hoists that are attached to an object and manipulating them to produce the desired effect. This works well for controlling simple shows and moving objects in linear ways. However, for more complex or intricate movements this soon becomes a headache for the operator and is often very time consuming involving a lot of trial and error. This is where the notion of dealing with a construct (the object suspended from the hoists) rather than all of the hoists attached to it becomes so appealing. The operator simply moves the object (using the 3D programmer) and K2 works out how far and at what speed the hoists need to travel in order to accomplish that. K2 has the ability to import .3DS (3D Studio) files allowing constructs to be correctly allowing K2 to more accurately represent the real world. How do I set up Lookup Tables in K2? In K2 go to the Show Contents menu and then to Lookup Tables. Click on New and then select the Lookup Table file you have previously created. Click on Open and if the file has been correctly formatted a box will pop up to tell you the table has been successfully imported. In the row that appears you can give the Lookup Table a name to easily identify that table. To add the path data to a channel go to the properties of the construct that owns that channel and then go to the Links section of the properties. In the Length Calculation section click on the Table cell and select the Lookup Table you want to work with. The only other column to be concerned with is the Input Column which tells K2 which of the data columns in the table to use for this particular channel/link. What’s the difference between a Page and a Template? A page is a pre-stored arragement of cue-lists on playbacks. Each Page can be given a name and can be recalled at any time. Pages can be ‘built’ to reflect a certain section of a show, to reflect the types of devices being moved or a combination of both. Page 1: Cuelist 1 is loaded onto Playback A, Cuelist 2 on Playback B and Cuelist 3 onto Playback C. Playbacks D, E and F are all empty. Page 2: Cuelist 4 is loaded onto Playback D, Cuelist 5 on Playback E and Cuelist 6 onto Playback F. Playbacks A, B and C are all empty. Page 3: Cuelist 99 is loaded onto Playback F. Playbacks A, B, C, D and E are all empty. If you select Page 1 then you will have instant access to Cuelists 1, 2 and 3 but nothing else, if you select Page 2 then you will have access to Cuelists 4, 5, 6 only. Page 3 will clear all the playbacks except F which will have Cuelist 99 loaded in. Template Pages allow you to select a Page that will always be available to the user as long as it is not overwritten by the current Page. If you now set Page 3 as the Template and then select Page 1 you will see Cuelists loaded onto Playbacks A, B, C and F. This is because Page 1 gives you A, B and C and the template gives you F.
If you select Page 2 however then you will only see Cuelists 4, 5 and 6 on D, E and F respectively. This is because Page 2 has its own Cuelist assignment for Playback F and so this overrides the Template assignment. If you think of the Template Page as being written on paper and all the other pages being written on a transparency then when you select a Page you are laying that transparency over the Template. If there is nothing assigned to a particular Playback in a Page then you can see through to the Template below and the Template’s Cuelist will be available on that Playback instead. Any Playbacks with Cuelists assigned in the current page will obscure the view of the Template below for that Playback therefore overriding the Template’s Cuelist with the current page’s Cuelist instead. K2 uses Lookup Tables when there is a particular path that you wish a channel to follow and it is too complex, unique or precise to be able to program it via the position of the construct. K2 needs Lookup Tables to be stored in a comma delimited file format (csv) in order to read them in. Once loaded the data is stored internally in the show file and access to the original file is no longer required. What file format are Lookup Tables stored in? Lookup Tables are stored in a comma delimited (csv) format. The easiest way to create the table is using a spreadsheet program such as Microsoft Excel. The rest of this answer assumes the use of a spreadsheet program. The first column represents the distance along the programmed path. This is shown in percentage points. There can be as many or as few points as you wish although the more points that are entered the smooth and more accurate the motion will be. The points do not have to be evenely spaced e.g. every one or two percent. If it is important that a particualar section of the path is very accurate then points can be added closer together at this section in order to ensure precise path following. The only requirement is that the first row is 0% and the last row is 100%. Add one column for each channel that will be following a path in the show and fill in the position in millimetres that the channel should be at for each percentage way point (i.e. a position in every row in the spreadsheet from 0 to 100%). Save the completed sheet as a comma delimited file with a file extension of .csv. An example file is attached to this answer. What is ‘Zero Height Reference? Take the example of a simple chain hoist hanging from a point 20m above the stage. K2 works by calculating how much chain is hanging out of the hoist at any point.This is the opposite of what the controller needs to know as it is interested in how high above the ground the end of the chain is. Zero Height Reference is the length of the chain at the point where the operator would consider the flown item to be at zero height. In our example above this means that 20m of chain would have be hanging from the hoist in order for the end of the chain to touch the floor and therefore be at zero height. The Zero Height Reference would therefore be 20,000. What is ‘Save Version Copy’ ? You would use ‘Save Version Copy’ (SVC) when you want to save the show file in an older file format. This is useful if you upgrade K2 to a version that incorporates a file format streaming change which means that the file is no longer back compatible. If you later want to downgrade your K2 version for whatever reason then any changes made to the file since you upgraded would be lost as the older version of K2 won’t open the newer file. If you use SVC then you will have a compatible file format for your older version. Which version it saves back to changes as the K2 software evolves in order to ensure that there is no chance of downgrading too far and using a version which may have bugs that are fixed in later versions. When using an Active Backup, how long does the temporary master last before it reverts back to an active backup only license? The automatic ‘upgrade’ from Tracking Backup licence to Live licence lasts 2 days. After that the Tracking Backup will either need upgraded to a Full licence (time-limited or unlimited) or it will need reconnected to a fully licenced K2 program in order to reset its full licence timer.